Apartheid (separate or apart) was their main agenda. 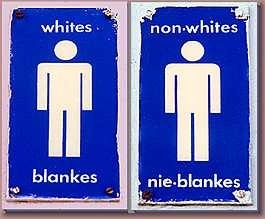 Non-Whites South Africans could no longer: Marry outside of their own race, Choose where to live, Travel where they liked. The whites made up 15% of the population yet owned 87% of the land. Enforced by the army and police force. During 1948 an All-White National Party comes to power, with Apartheid as the main topic on their agenda. Soon after, A doctrine of white supremacy and seperate development was created. As a result, any Non-White South Africans were not permitted to marry inter racially, choose where they were to live and also could not travel as they pleased. The Caucasian race made up 15% of the South African population, although they owned a shocking 87% of the land. Additionally anyone of other descent was forced to lived on Bantustans. Lastly these rules were strictly enforced by the army and police force.